Beekeeper’s Naturals raw bee pollen comes from green apiaries in remote locations in British Columbia with a rich variety of wildflowers for the bees to enjoy. Beekeeper’s Naturals pollen packs a nutritional punch compared to the typical store bought, dried out varieties. Not only can you taste the difference but Beekeeper’s Naturals pollen is coming from the highest quality foraging grounds and never heated or treated to preserve all the natural enzymes and vitamins! Bee pollen is full of protein, B vitamins, minerals and free-forming amino acids. This superfood is fantastic for anyone leading an on-the-go lifestyle and looking for a natural energy and vitamin boost. Top your granola, smoothie, avocado toast or salad to help you thrive! Add bee pollen to your smoothie, salad, yogurt or dessert and enjoy! Do not use if you are pregnant or breastfeeding or if you are allergic to bee products or pollen. I first tried Bee pollen in a smoothie that I bought at the Wild Oats cafe and after that experience I was addicted. I sprinkle the Bee pollen over my smoothie..it tastes like delicious candy and it gives me a lot of energy. Excellent product. 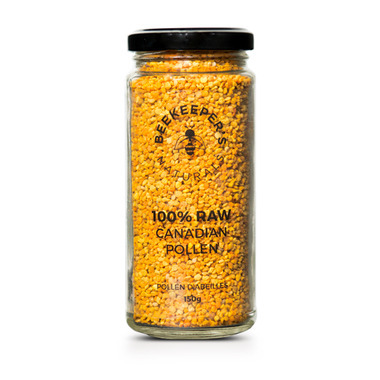 I love Beekeeper's Naturals and this 100% Raw Canadian Bee pollen. It's delicious, nutritious and a little goes a long way. Just make sure to store it in the fridge for prolong the freshness. It's a bonus that Beekeeper's Naturals is a Canadian company.